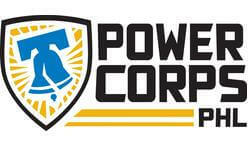 Launched in September 2013, PowerCorpsPHL is a City of Philadelphia AmeriCorps initiative. Operated in partnership with EducationWorks, PowerCorpsPHL engages Opportunity Youth in transforming their lives through service. PowerCorpsPHL enrolls members in full-time AmeriCorps service for 6-12 months with City departments to tackle pressing environmental challenges, including the need for improved stormwater management, increased tree coverage, and revitalized public land. Through a rigorous combination of service and training, corps members develop and practice essential 21st Century workforce skills, including time management, conflict resolution, accountability, teamwork, leadership, and network building. Making communities cleaner, safer, and healthier through the revitalization of public spaces and green infrastructure, the first 6 months of PowerCorpsPHL focus on career exploration, envisioning one's future, and building foundational skills. From there, corps members specialize into specific career tracks that include a combination of on-the-job-training and career-connected credentialing. As alumni, individuals receive the customized support they need to secure and succeed in career-track employment, advance through post-secondary education, and/or enroll in additional national service. Since our inception in September 2013, PowerCorpsPHL has engaged 272 young adults (18-26 year olds) who were not in school and not working to serve as AmeriCorps members with Philadelphia Parks & Recreation and Philadelphia Water. Together, we have revitalized over 3,100 acres of public land, planted over 3,800 trees, removed over 210 metric tons of debris, recycling 60% of it, and contributed over 241,000 hours of service. As of May 2016, 201 young people (92% of alumni) have successfully transitioned to employment, post-secondary education, and/or continued serving with AmeriCorps. Next steps for each PowerCorpsPHL alumni are different based on the education, training and work experience required to achieve their long term aspirations. At the end of each cohort, approximately 25% of PowerCorpsPHL graduates re-enroll in a second term of National Service, 50% transition directly to paid work and 20% pursue post-secondary. Many individuals are engaged in more than one of these three things.